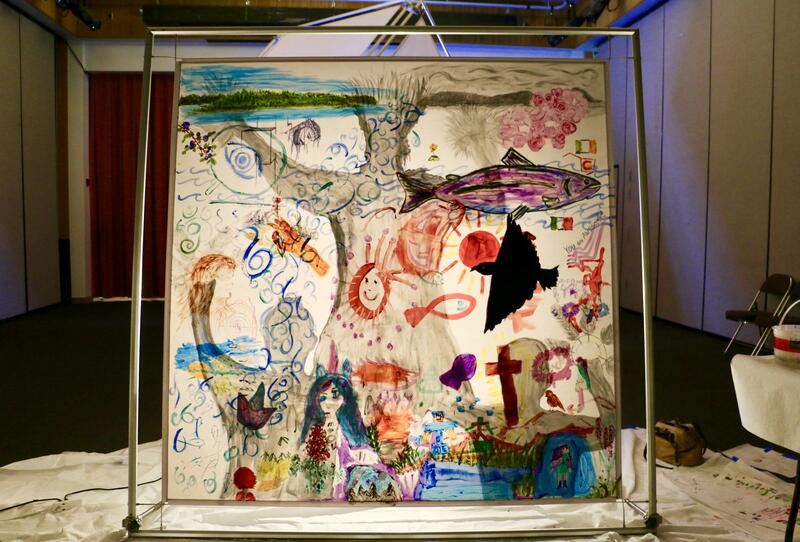 The Bethel community came together to paint a panel of a glowing cube titled "Something Very Beautiful," an art exhibit by Bethel artist Josh Fisher. Over the New Year’s holiday, members of the Bethel community came together to create Something Very Beautiful. 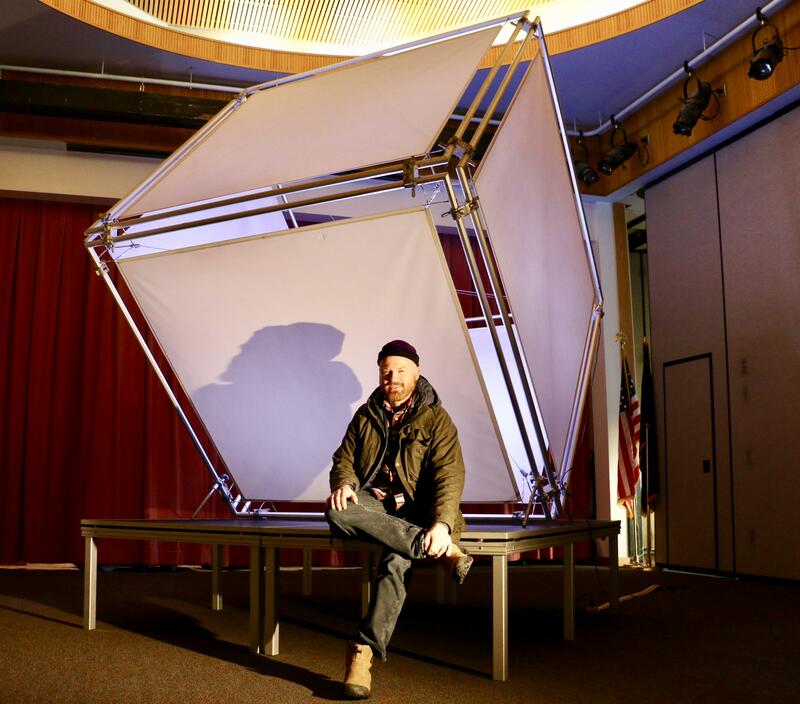 That name, “Something Very Beautiful,” is the title of local artist Josh Fisher’s recent art exhibit: a larger-than-life, glowing cube. The Bethel community picked up paint brushes and markers to help Fisher with his piece, which has been in the works for more than a decade. The cube, resting on a pointed edge, towers high and massive. Each square of the cube spans 6-feet by 6-feet. The sides are a series of white, translucent fabric stretched between metal poles; a light placed inside the cube illuminates the entire structure. Artist Josh Fisher only wishes that he could have made the piece bigger. The cube’s ultimate destination is unknown. Currently it’s standing in the Bethel Cultural Center, where Fisher invited the community to paint and draw whatever they found beautiful on one panel of the piece. Over five days, more than 30 people, ages two and up, lent a hand. Bethel artist Josh Fisher constructed a glowing cube for people around the Yukon-Kuskokwim Delta to paint as a form of unified regional expression. Fisher wants to take the cube throughout the Yukon-Kuskokwim Delta and have other communities paint what they find beautiful on its panels. Just as a cube’s sides are interlinked, Fisher says that he wants the painted panels to interlink the region. The cube’s journey began a long way from the Y-K Delta. Fisher found the materials in a scrapyard in South Carolina 13 years ago. He brought them to Bethel when he moved up with his wife in 2017. They loaded the pieces in the back of their Ford Explorer and barged the whole thing north. After years of tinkering, Fisher couldn’t leave the project behind. Those smaller projects include painting with oils, playing classical guitar, and baking artisan bread. Fisher is not a full-time artist. He works at Yuut Elitnaurviat, where he helps adults earn their GEDs. In the past he’s worked in finance, taught music, and led college tours. Art has been something that he’s made time for on the side. How to do that amid life’s daily demands inspired one of the most valuable and unexpected parts of this project. As community members painted a panel of the cube, they discussed their own struggles and ambitions with balancing jobs, family, and artistic dreams. 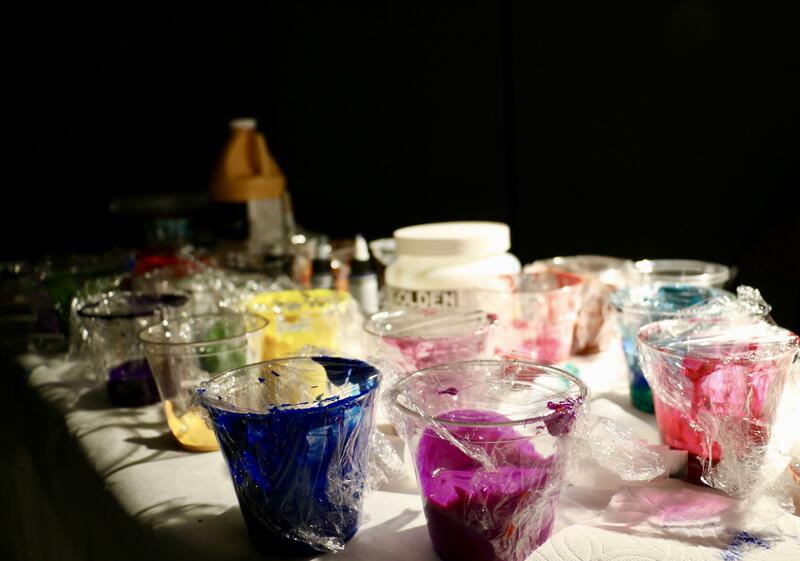 Bethel community members used acrylic paints to depict something they found beautiful on the art exhibit "Something Very Beautiful" by artist Josh Fisher. For Fisher, that space happens when he keeps his materials in the open, ready for his hands to begin working. It’s similar to surrounding a towering cube with paints and markers and inviting the community in.